Set a time: The most important part of getting in shape is making it a routine. Set a time during the day that works best for you. For some, this may be first thing in the morning. For others, after work may be ideal. The important thing is to be consistent. Use quick cardio: During a busy day, finding time to exercise can be a challenge. Fortunately, quick cardio workouts can be done virtually anywhere without taking a whole lot of time. Even just a quick ten minute run in the morning or after work can get your heart rate going. Try something new: New equipment, new workouts, entire new routines—doing something new will keep your exercises interesting while providing a more comprehensive workout. Try incorporating a BOSU ball to intensify strength training or playing a new sport that you’re not familiar with. Use the stairs: This is more than just taking the stairs whenever you have the option. You can use the first step as an exercise aid to intensify pushups and do various cardio routines. If you have stairs in your home, this can be a great resource when the freezing temperatures of winter strike. Target everywhere: Glutes, abs, upper body, everywhere can stand to be trimmed and strengthened. Not only will you get a more comprehensive workout from targeting each part of your body individually, but you’ll also make workouts more interesting as they change from day to day, making it far easier to maintain the habit. Establish the habit: Finally, as mentioned before, consistency is key. It takes about a month to completely ingrain an exercise routine and make it a habit, so stick with it for at least that long. 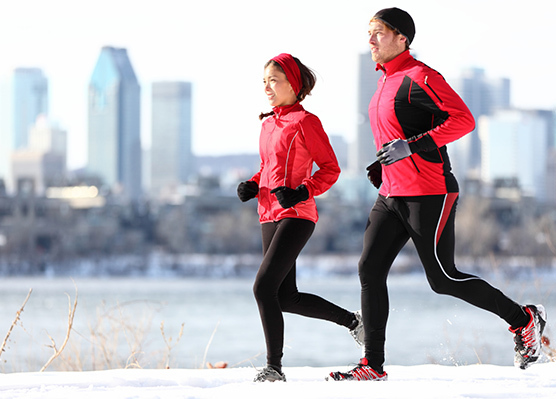 After that, it will be much easier to maintain your exercise regimen throughout the winter. As you form healthy exercise habits now, they’ll carry you through the winter and make it that much easier to stay trim and fit for the holiday season. Coupled with a great diet supplied from Nashua Nutrition– you’ll look better, feel better, and be on track to a much healthier lifestyle that can last you through the doldrums of winter.